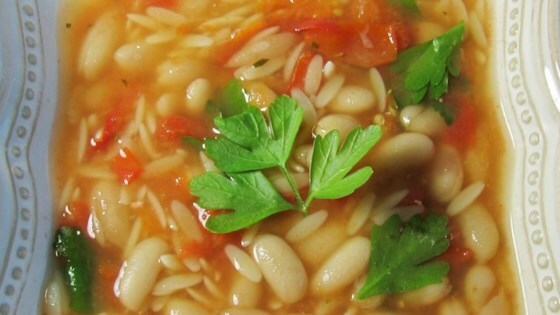 Add these, then simmer until tender, 10-20 minutes: 2 16-ounce cans white beans, drained; 1 cup small pasta, such as ditalini; 1 14.5-ounce can diced tomatoes; 2 tsps. minced fresh rosemary. Before removing from heat, stir in: 1/2 cup chopped fresh parsley. Get the recipe for Fast Chicken Soup Base. Very good, I use the small soup pastas all the time anyway, my family prefers them over noodles. The whit ebeans giv eit more protein too! I used orzo pasta in my homemade chicken broth, and instead of using canned tomatoes I diced some plum tomatoes from the garden. This is very simple and very good.